Equity-oriented mutual funds are set to get cheaper from Monday. With the new fee slabs that investors pay to remain invested in mutual funds — known as Total Expense Ratio — setting in, the dynamics for the mutual fund industry is set to change. Equity schemes with bigger assets under management will become cheaper, while investors will have to pay a higher cost for the smaller ones. Wealth advisors said, however, investors should not focus on the cost of funds alone as bigger equity funds could face challenges with managing large corpuses compared to their smaller peers. Late in 2018, the Securities and Exchange Board of India (Sebi) had announced it would cap the total expense ratio (TER) at 2.25% for equity funds to ensure that fund houses passed on the benefits of their growing asset size. With increasing fund sizes, the quantum of reduction in TER increases. “Mutual fund investors will have the benefit of lower expenses. Sebi has pushed economies of scale for the benefit of investors,” says Nilesh Shah, managing director, Kotak Mutual Fund. He believes fund houses and distributors will look to expand reach to ensure that benefits of low-cost investing reaches to every deserving investor. “Investors may expect up to 25 bps cut in TER in some of the larger schemes, but the impact will be much lesser in smaller schemes,” points out Swarup Mohanty, MD, Mirae Asset AMC. 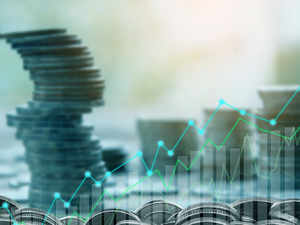 Vidya Bala, head – mutual fund research, FundsIndia, argues that the cut in costs will not make a material difference to returns from equity funds, apart from narrowing gap with total returns index (TRI) linked benchmark return. Debt funds are likely to see a much higher impact on performance as these are more sensitive to costs. Morningstar India said the introduction of new slabs with a lower TER limits will result in a reduction of overall Total Expense Ratio of equity oriented funds with assets greater than ₹2,000 crore. Funds with assets size of less than ₹2,000-crore will continue to have a similar TER as before. “For instance, this move will result in a reduction of 9 basis points in the TER of a fund with an AUM of ₹5,000 crore, but a fund with an AUM of ₹20,000 crore will witness a reduction of TER to the tune of 28 bps,” said Kaustubh Belapurkar, director (fund research), Morningstar India. This means an investor in a scheme with assets of ₹20,000 crore paying an expense ratio of 2% could now pay expense of 1.72 – 1.75%. That means on an investment of ₹1 lakh, he can save as much as ₹250- 280 annually, which will get added to his overall returns in the scheme. The benefits of lower expense ratio will reflect over a longer investment period. 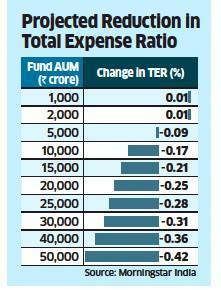 Lower the expense ratio of a fund, higher is the chance of the scheme beating its benchmark index. As per data available on February 2019, there are 11 activelymanaged equity oriented mutual fund schemes that have assets above ₹20,000 crore, which indicates many investors are likely to benefit from this move. “Larger the size of the scheme, higher is the benefit for investors,” said A Balasubramanian, CEO, Aditya Birla Sun Life Mutual Fund. Wealth managers believe investors should not buy a fund strictly on the basis of lower costs. Expense is just one parameter for choosing a fund. Many small-cap funds, for example, might keep their AUMs low by restricting lump sum investments. In such cases, the expense ratio of such funds will be high. “If your risk profile merits a small-cap fund in your portfolio whose performance is good and you trust the fund manager, you should opt for it even if it means paying a higher expense ratio,” said Rupesh Bhansali, head (distribution), GEPL Capital. Though there is no evidence so far that large funds tend to underperform their smaller peers, fund managers concede that size is a challenge in mid- and small-cap schemes.